For Yogi Andre Bolourchi, an Indian holy man was someone who lived in solitude, practiced celibacy, had a beard, and wore many malas. This stereotype lifted when he met Krishna, an Indian ascetic and Yogi who taught Yoga on the beaches of Goa. 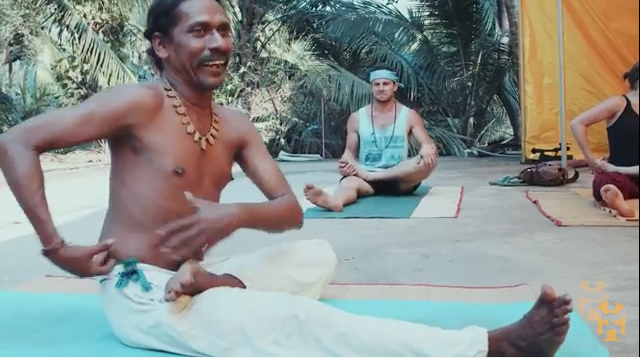 We stumbled upon the video of Andre practicing Yoga and learning Ayurveda with Krishna in Goa through the World Nomad’s YouTube channel. Since we loved what we saw about Andre’s Indian Yoga experience, we got in touch with him to find out more. Andre started practicing Yoga in his 20’s after a basketball injury. He was given two options – surgery or Yoga and he opted for Yoga out of pure necessity and not a choice. Today, he practices Kundalini Yoga and thinks of Yoga as a combination of art and science bundled in together which has helped him listen to his physical body better. Like most first time travellers to the Indian subcontinent, Andre did have an idea of the Indian travel experience but didn’t understand how it would all feel. ‘’ As a “westerner” looking from the outside in, India seems like this overwhelming hodgepodge of worlds colliding into one another- its vast history, the richness of so many subcultures, it’s burgeoning population, and, quite literally, the thousands of dialects, demigods, and mouth-watering delicacies- all coexisting in any given moment. I was intrigued to see what a yoga practice would be like in India-arguably the birthplace of yoga itself- but I just couldn’t fathom how it would be.’’, he shares about his first impressions of travelling in India, the birthplace of Yoga. Krishna, a modern day holy man or baba, we learn has travelled to all the four corners of India. ‘’For about 30,000 kilometres all around India for the last 25 years. It’s kind of a record.’’, says Krishna in the video. He also goes on reveal how he left his Guru after 18 years and travelled to Goa to teach Yoga based on his Guru’s instructions. Krishna’s Yoga classes in Goa consist of small groups of mostly foreign travellers. Andre spent a few days practicing Yoga with Krishna, which he shares was similar to what he had experienced in The States. He also learnt about Ayurveda cooking, the use of spices and how to use food as your medicine. ‘’ Yoga with Krishna wasn’t your typical, westernized “power yoga” class- with fluorescent lights, in a sterile studio. Class was held outside, under a beautiful ceiling of palm leaves hanging from its trees. There were no membership passes or items to purchase for retail. He had no self-promotion technique or personal branding of “his yoga”. It was true yoga- a simple union of us gathered, open and engaged with our own experience. It was refreshing.’’ The classes were concluded by a fire ceremony known as Agnihotra, which is a healing fire ceremony. Video courtesy World Nomads and inputs from Andre Bolourchi. For more information about Yoga in Goa, check out our detailed guide here.